This post is a summary of the salient points from the Scrum Alliance State of Scrum Survey 2015. In February 2015, Scrum Alliance® surveyed almost 5,000 people about their use of Scrum. The survey respondents make up a diverse group, representing 108 countries and more than 14 industries. They reflect a range of functional areas, including IT software development, product development, operations, human resources, executives, and sales and marketing. Most have a technology slant, with 44% working in software development and 33% in IT. And they’re an Agile-savvy group, involved in an average of 4 Agile projects in the last 12 months. I. WHO IS PRACTICING SCRUM? • Scrum practices are currently in place among 82% of respondents, and another 11% are piloting Scrum. • IT and software development professionals continue to be the primary users of Scrum, followed by product development and operations professionals. II. WHY ARE THEY PRACTICING SCRUM? 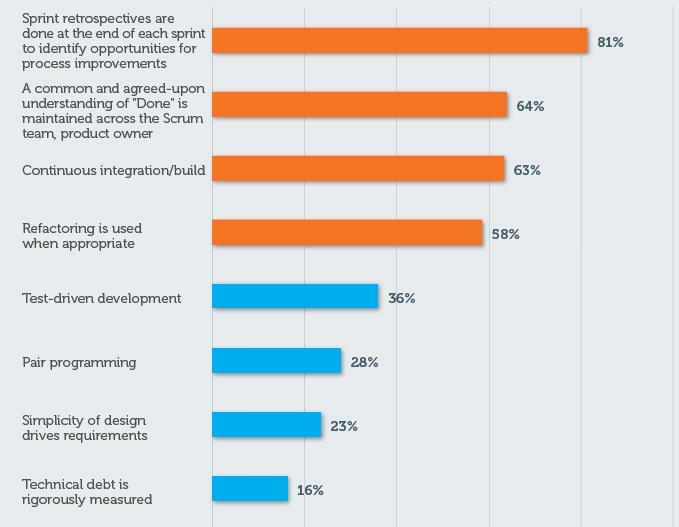 •Nearly half the respondents (49%) cite fulfilling customer needs as the highest business priority for Scrum projects. • Meanwhile, the second-highest priority is all about the business — meeting budget, time, and scope constraints. III. HOW ARE THEY PRACTICING SCRUM? • The average team size is 7 people. • Most Scrum teams (60%) follow 2-week sprints. • 81% hold a team Scrum each day. • 83% conduct sprint planning prior to each sprint. • 81% hold retrospective meetings. 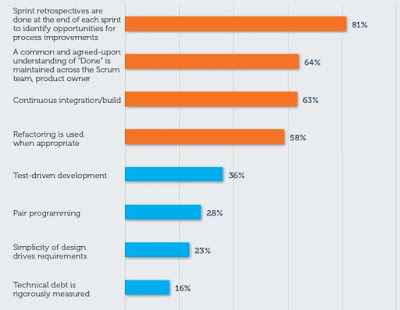 • 42% of respondents report using Scrum exclusively. • Of those using a combination of practices, 63% practice Scrum alongside Waterfall. • 43% combine Scrum with Kanban. • 21% combine Scrum with Lean. • The overall success rate of projects delivered using Scrum is 62%. • It’s rarely required but commonly recommended. • 81% of respondents believe certification has helped their Scrum practice. 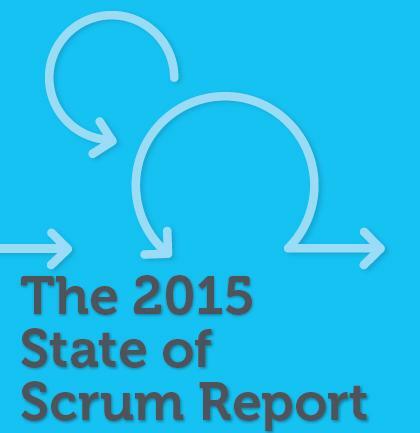 • 95% of respondents say they plan to continue to use Scrum moving forward. 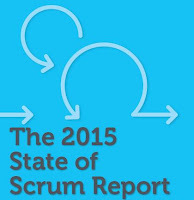 You can download the detailed report from the Link of State of Scrum Report - 2015.